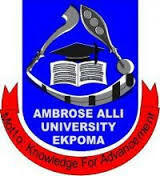 Ambrose Alli University, AAU Ekpoma Results Computation Notice to all Final Year Students of 2017/2018 Academic Session. This is to inform all Final Year Students of the Ambrose Alli University, AAU Ekpoma that the Result computation for 2017/2018 academic session will be strictly based on courses registered online and not on school fees payment alone. This means students who pay fees without registering courses online will be treated as "NO EVIDENCE OF REGISTRATION"